I visited the UMMA Graphic Design mini-exhibit this past Sunday; just six of the selected pieces remained on display. I was happy to see that it strongly featured Art Nouveau. 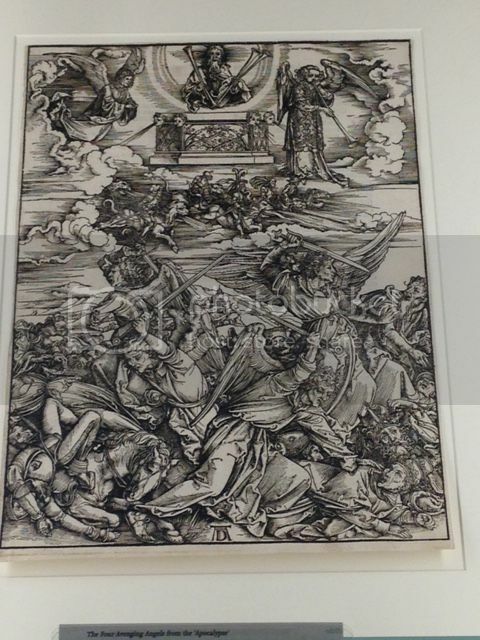 The first piece I noticed was ‘The Four Avenging Angels from the Apocalypse’ by Albrecht Durer. It reminded me very much of an Arts & Crafts piece - specifically William Morris - but was created hundreds of years before that movement. 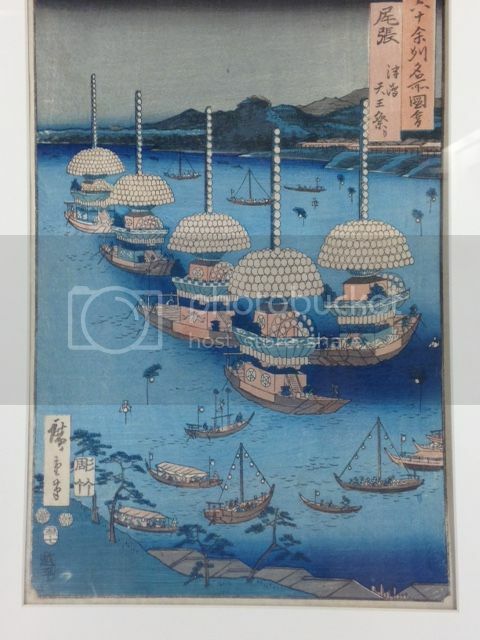 The second piece I noticed was of the Ukiyo-E piece by Ando Hiroshige entitled ‘The Tenno Festival at Tsushima in Owari’. The color scheme and simplicity in line work of this piece is beautiful; it’s easy to see how the Art Nouveau artists utilized the inspiration they drew from these works. 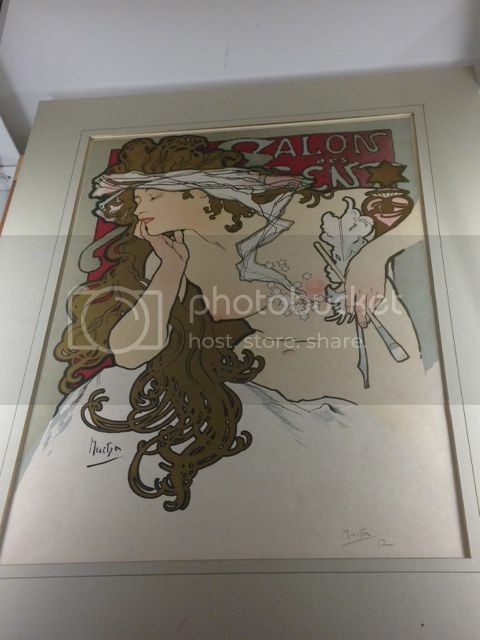 My eye was then drawn to piece done by Alphonse Mucha, ‘Salon des Cents’. In examining this artwork, the density of the paper stood out to me even before I saw that it was only one of two pieces which specifically mentioned kind of paper used. It was unmistakably Mucha’s work, featuring his trademark artistic style and feminine subject matter. 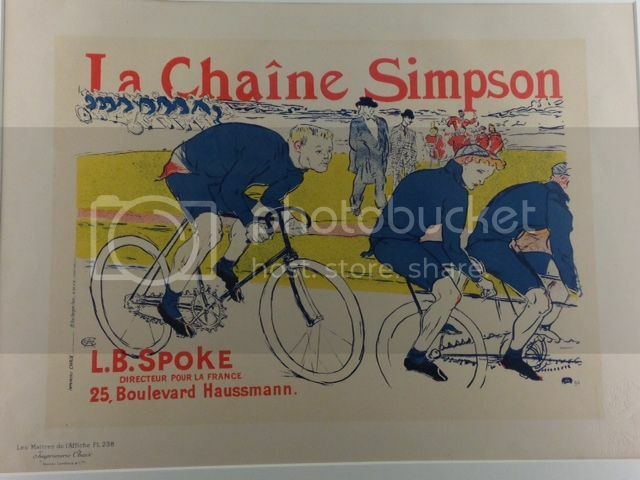 The next piece was ‘La Chaine Simpson’, which didn’t automatically register as a Henri de Toulouse-Lautrec piece. The subject matter caught me off guard, as he typically depicted nightlife and gussied-up women. This artwork made me more curious about the color lithograph process, as there was a bit of “coloring outside the lines” in some areas. 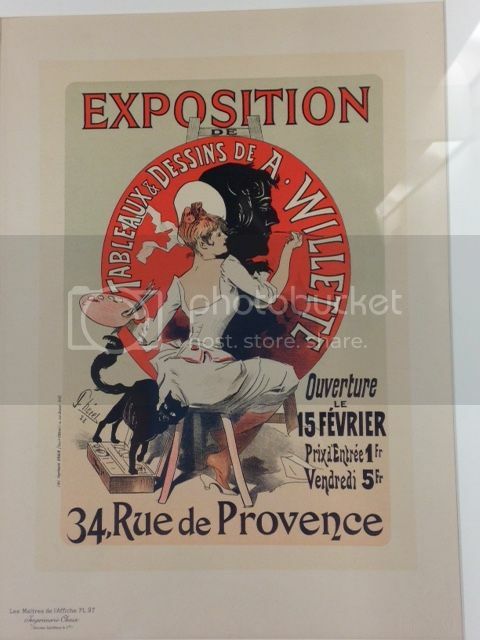 ‘Expositions’ by Jules Cheret was my favorite piece. There’s a lot of movement in this work, the colors are deep, and the subject matter and typography are both fun. It’s also the piece which seems to have the most consideration for and utilization of communication. It is indeed a poster, which Cheret was famous for crafting. 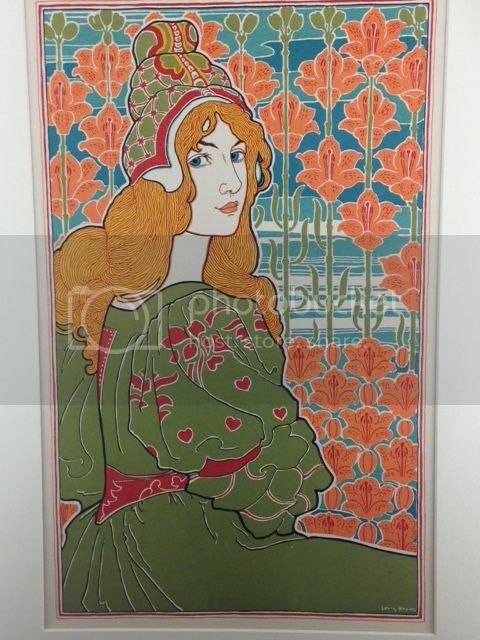 The last piece I examined was ‘Jane’ by Louis Rhead, which struck me as having both Art Nouveau and Arts & Crafts aspects. The attire worn by the woman, as well as the pattern of flowers in the background look Arts & Crafts, whereas the linework and color appear more Art Nouveau.